C.14799 - Tavira is one of the finest luxury towers in Bonita Bay. This home was previously a model designed to impress! Great views of the Estero Bay. The centralized gourmet kitchen features a Wolf gas stove top and center island with sink. The family room has an electric fireplace and beverage bar with two wine coolers. Enjoy sunsets and fabulous Bay views on the spacious West facing terrace enhanced by an outdoor kitchen and vented grill. Quality built-in closets in the Master. Tavira, Bonita Bay's newest completed high-rise, offers luxury amenities. Tavira has two guest suites and resident manager. There is a fitness center, sauna and massage spa, theater, club room with catering kitchen, billiard room, large resort style pool and spa with cabanas and gas grills. Large screened in poolside cabana with bar, TV and fireplace. Spectacular roof top terrace. Indoor golf driving range. Bonita Bay, a gated community, welcomes owners to a complete luxury lifestyle. 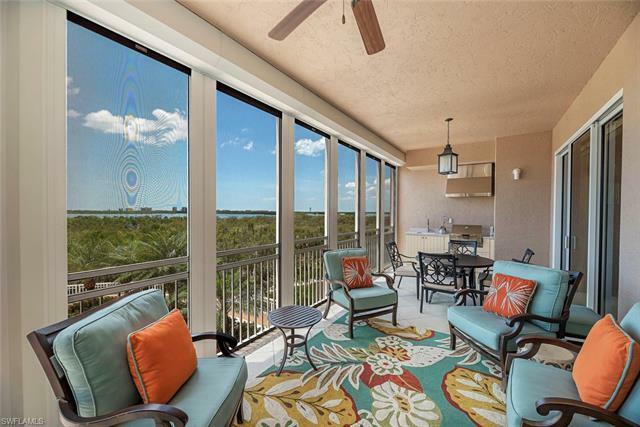 Bonita Bay has 5 golf courses, an 18 court tennis center, 4 restaurants, a new âLife Styleâ 18, 000 s/f fitness center, private beach, full service marina, 3 parks, 12 miles of biking/walk trails, and much more.